Bank Farm Leisure is situated on the beautiful Gower Peninsula in the small village of Horton. Bank farm is a family run concern, the Richards family being the original farmers of this lovely 75-acre site. 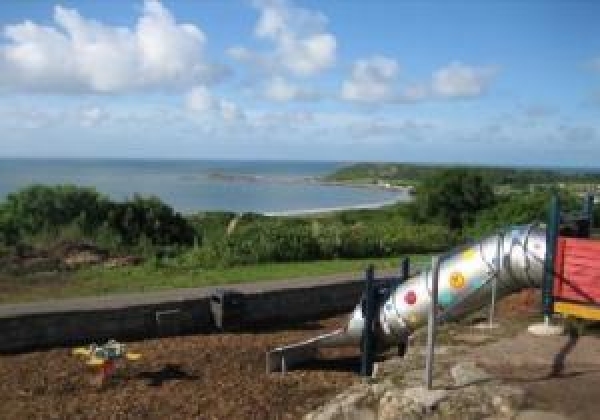 The leisure park is situated at the top of Horton village, commanding a breathtaking view of Horton and Port Eynon Bay. A wide range of accommodation is available, from pitches for camping to touring caravans, to renting one of our cosy family Holiday Bungalows. We also have privately owned caravan holiday homes on the park, which can be purchased brand new. We cater for a wide range of people from families with young children up to the more mature couple wanting a quiet break. Here at Bank Farm we accept caravan rallies at a discounted price for units of 20 plus and catering up to 150 units, please call for more details. We also accept those that are doing the Duke of Edinburgh Award as well as school parties. One of our Bungalows has been adapted for wheelchair users and people with mobility problems and visual impairment. For further details on this Bungalow please see the link above to the Bungalow page. Near Oxwich - Gower Peninsula - a sandy composition 2.7 miles away. Near Rhossili - a sandy and rocky composition 3.4 miles away. Near Nicholaston - Gower Peninsular - a sandy composition 3.5 miles away. Near Rhossilli - a sandy pebble and rocky composition 3.8 miles away.